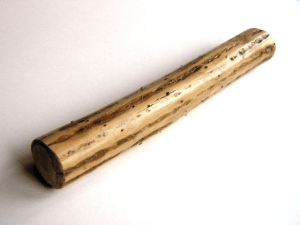 What is a Rainstick ? A rainstick is a long, hollow tube partially filled with small pebbles or beans that has small pins or thorns arranged helically on its inside surface. When the stick is upended, the pebbles fall to the other end of the tube, making a sound reminiscent of rain falling. The rainstick is believed to have been invented by the Aztecs and was played in the belief it could bring about rainstorms. Rainsticks are usually made from any of several species of cactus. The cacti, which are hollow, are dried in the sun. The spines are removed, then driven into the cactus like nails. Pebbles or other small objects are placed inside the rainstick, and the ends are sealed. A sound like falling water is made when the rainstick has its direction changed to a vertical position. Start by cutting two strips of cardboard and two discs of card roughly the same size as the ends of your tube. The strips need to fit inside your cardboard tube, mine are about an inch wide. Concertina the strips of cardboard. Place one card circle over the end of the tube and tape it firmly in place. Place the other card circle over the open end and tape in place to close the tube.